Poll: What do you rate this mod? Poll: What feature do you most prefer to be added next? Poll: Should More Uses For Pumpkins be Updated? 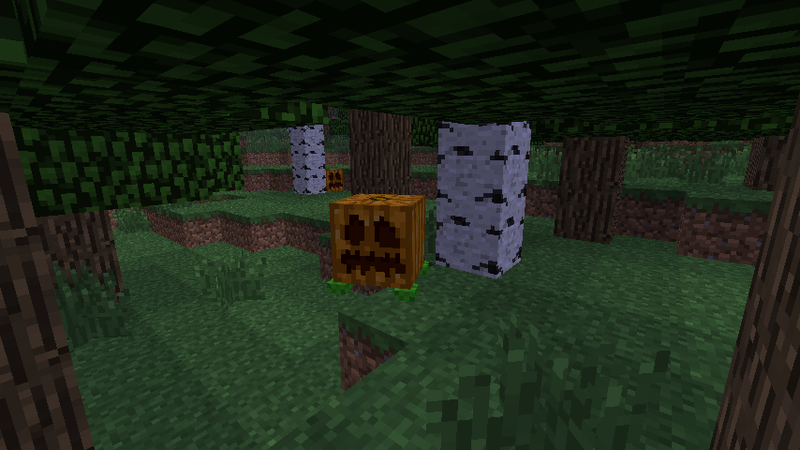 I have been thinking recently, about re-making More Uses For Pumpkins with JRucker81, and updating it to the latest Minecraft version, and frequently expanding this mod again. So I have one simple question for you, the community. Should More Uses For Pumpkins be Updated? I would like to see answers from you, so please put a vote in the poll, letting us know if you would truly like for this mod to be revived. As it will be a lot of hard work, because we will have to re-make MUFP from scratch which will take a lot of time, and effort. Please post your thoughts about this, and ask me questions that you may have, I will be happy to answer them! 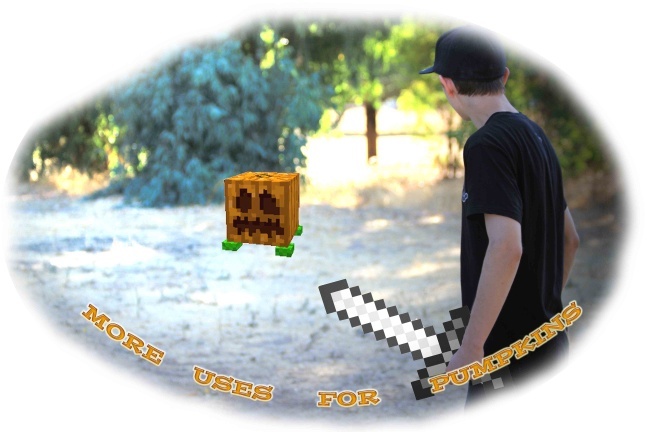 More Uses For Pumpkins is a balanced mod that adds more recipes, items, blocks, mobs, and uses to Minecraft that has to do with Pumpkins, giving you more reasons to farm them! Natural Pumpkins are also more common. This mod requires Modloader. Heals : 3 food points. Ingredients : 3 Dough, 2 Sugar, 2 Eggs, 1 Pumpkin Powder, and 1 Bucket of Milk. Your Bucket is returned. Info : Smelt Raw Pumpkin Pie to get Pumpkin Pie. Heals : 9 food points. Ingredients : 1 Raw Pumpkin Pie. Info : Obtain Pumpkin Pie by smelting Raw Pumpkin Pie. Heals : 1 food point. Ingredients : 1 Pumpkin seed. Info : Obtain Roasted Pumpkin Seeds by smelting Pumpkin Seeds. Heals : 4 food points. Ingredients : 1 Pumpkin Powder, 1 Seed, and 1 Pumpkin Shard. Info : Obtain Pumpkin Soup by crafting the required ingredients. Heals : 2 food points. Info : Obtain Pumpkin Shards by breaking a Light Pumpkin. Ingredients : 2 Dough, 1 Pumpkin Powder, and 1 Roasted Pumpkin Seed. Info : Obtain Pumpkin Cookies by crafting the required ingredients, you get 4 Pumpkin Cookies for every one you craft. Heals : 3 1/2 food points. Ingredients : 3 Dough and 1 Pumpkin Powder. Info : Obtain Pumpkin Bread by crafting the required ingredients. Ingredients : 2 Buckets of Milk, 2 Eggs, 2 Sugar, 1 Dough, 1 Pumpkin Powder, and 1 Roasted Pumpkin Seed. Info : Obtain Pumpkin Energy Bar by crafting the required ingredients. It heals very little but has a high saturation level. Ingredients : 1 Pumpkin, 1 Seeds and 1 Sugar. Info : Obtain Pumpkin Powder by crafting the required ingredients. Pumpkin Powder is a very common ingredient and is used to make several food items. 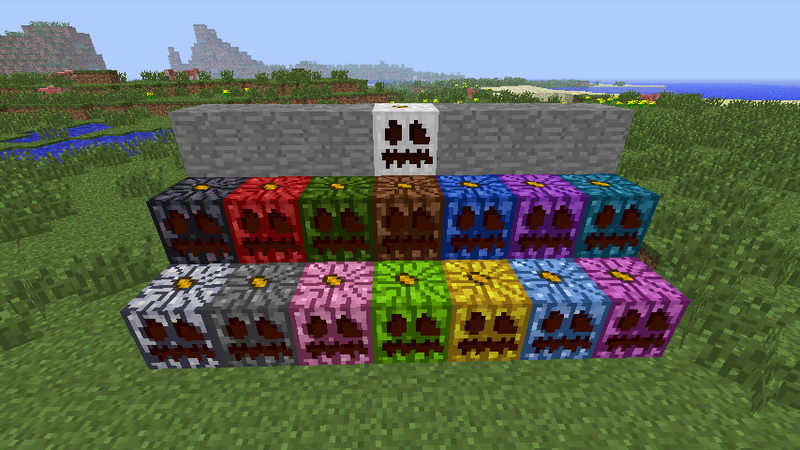 You get 4 Pumpkin Powder for every one you craft. Ingredients : 1 Wheat and 1 Bonemeal. Info : Obtain Flour by crafting the required ingredients. Flour is used to make Dough. You get 2 Flour for every one you craft. Ingredients : 1 Flour and 1 Bucket of Water. Info : Obtain Dough by crafting the required ingredients. Dough is used in recipes, currently only the Raw Pumpkin Pie recipe. You get 3 Dough for every one you craft. Heals : 1 1/2 food points. Ingredients : 1 Bottle Water and 1 Pumpkin Powder. Info : Obtain Pumpkin Juice by crafting the required ingredients. Drops : 5-8 Light Pumpkin Shards. Info : An uncommon type of pumpkin, and you may only find Light Pumpkins in Rivers or Oceans. The Light level of Light Pumpkins are very dim. 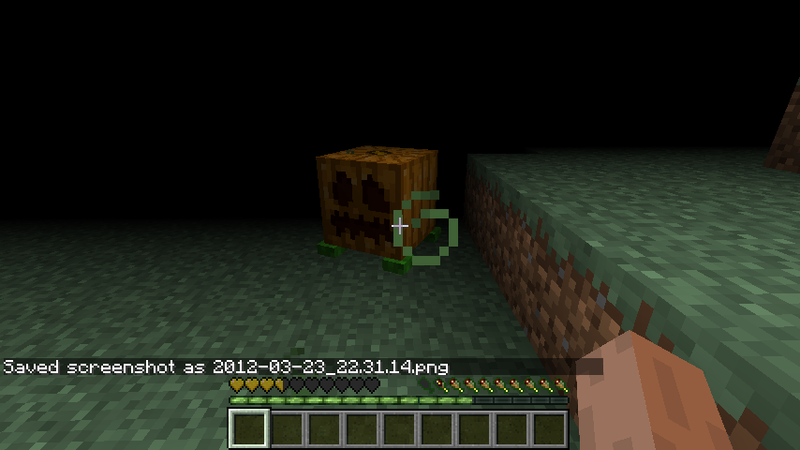 Drops : 1 Nether Pumpkin. Drops : 1 Black Pumpkin. Info : A decorative Pumpkin you obtain by crafting. Drops : 1 Red Pumpkin. Drops : 1 Green Pumpkin. Drops : 1 Brown Pumpkin. Drops : 1 Blue Pumpkin. Drops : 1 Purple Pumpkin. Drops : 1 Cyan Pumpkin. Drops : 1 Light Gray Pumpkin. Drops : 1 Gray Pumpkin. Drops : 1 Pink Pumpkin. Drops : 1 Light Green Pumpkin. Drops : 1 Yellow Pumpkin. Drops : 1 Light Blue Pumpkin. Drops : 1 Magenta Pumpkin. Drops : 1 White Pumpkin. Combat : If attacked by an Evil Pumpkin, you will be dealt 2 hearts of damage, and you will be Poisoned, Food poisoned, and Blinded. Information : Evil Pumpkins are found in some natural pumpkin patches. 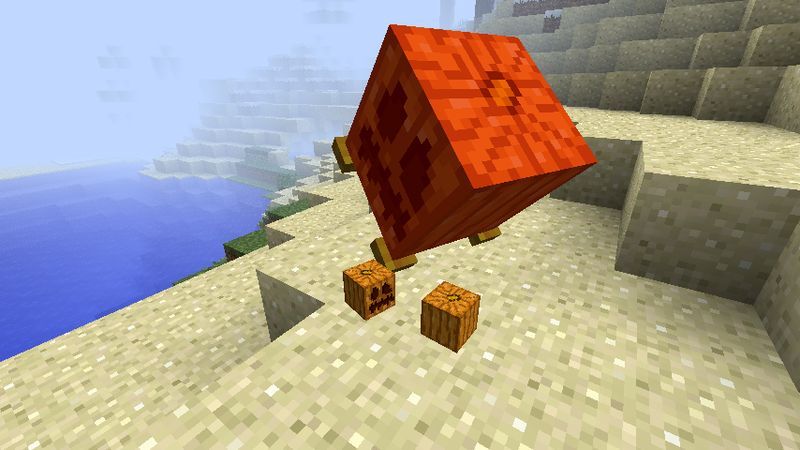 Once you break a pumpkin block, an Evil Pumpkin may spawn from that block. Craft the required ingredients in this shaped recipe to get Raw Pumpkin Pie. Craft the required ingredients in this shaped recipe to get Pumpkin Soup. Craft the required ingredients in this shaped recipe to get 4 Pumpkin Cookies. Craft the required ingredients in this shaped recipe to get Pumpkin Bread. Craft the required ingredients in this shaped recipe to get 4 Pumpkin Energy Bars. Craft the required ingredients in this shapeless recipe to get 4 Pumpkin Powder. Craft the required ingredients in this shaped recipe to get Flour. Craft the required ingredients in this shaped recipe to get Dough. Smelt Raw Pumpkin Pie to get Pumpkin Pie. Smelt Pumpkin Seeds to get Roasted Pumpkin Seeds. Smelt Pumpkins to get Orange Dye. If you have any nice in-game pictures that uses this mod, you may send us the picture(s) through a post in this topic and we may include it in this section! A Naturally generated Light Pumpkin. A placed Light Pumpkin, shown at night. Showing the Pumpkin Pie, Raw Pumpkin Pie, and Roasted Pumpkin Seeds. [Review for V1.5] Video by GKTheMinecrafter. [Review for V1.3] Video by Minecraftgplay. [Review for V1.1] Video by CopperWalrus. Here is the official list of features we will add in the 1.7 Evil Pumpkin update. We get several views and downloads daily for More Uses For Pumpkins, but hardly any feedback, comments or suggestions. We would really appreciate it, because it would help this mod grow. If your currently not a member of minecraftforum.net, and would like to post a comment about this mod, here is a link for a quick and easy free registration to join http://www.minecraftforum.net. Thanks for your time and have fun with this mod! 1 : Download and install Modloader, Modloader MP, Audiomod, and Forge Client 1.4 or higher. 3 : Open up the Minecraft directory. 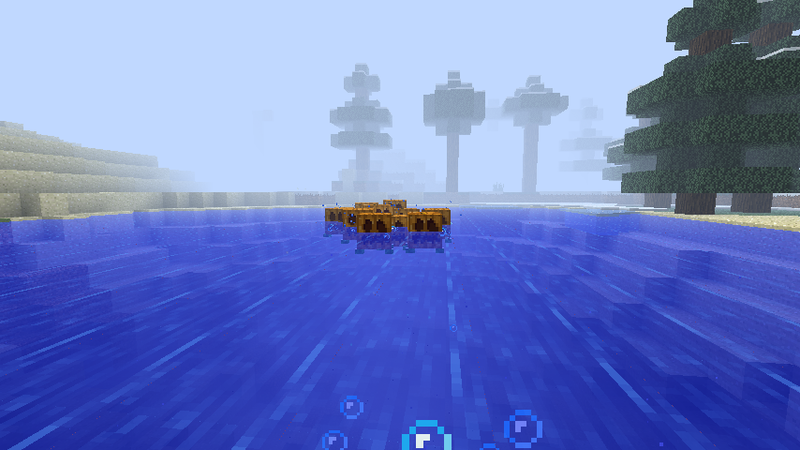 4 : Place More Uses For Pumpkins Mod.zip in the mods folder. 5 : Add resource folder to minecraft folder. 1 : Download and install Modloader, Modloader MP, and Audiomod for the client. 7 : Start the server and stop the server. Delete world folder then place moreusesforpumpkins_server.zip in the mods directory server side. Then restart the server. Place the code below the banner that you would like to use, in your signature. + Modloader MP and Forge are now requirements. + Changed Pumpkin Bread, Pumpkin Cookie, and Pumpkin Energy Bars crafting recipes. + Changed the name of "White Pumpkin" to "Light Pumpkin". + Added Pumpkin Energy Bar. + Changed Pumpkin Soup texture. + Changed Pumpkin Soup Recipe. + Changed Raw Pumpkin Pie texture. + Roasted Pumpkin Seeds now heal wolves. + Added eggs to Pumpkin Pie recipe. + Increased all foods by 1/2 a food point. Colored Pumpkins can only be placed facing towards the south. There have been no asked and answered questions yet. Here is a list of other mods that SGExplorer and/or JRucker81 are associated with. If you experience any bugs when playing this mod from a modpack, please contact the creator of the modpack, thank you. Want to support this mod? You can click the button in this post, download this mod, put one of this mods banners in your signature, or just tell your friends about it. It would be greatly appreciated! Answering a question in the poll would also help out! Thanks! Please send us feedback about the mod, we appreciate it! Appropriate suggestions and questions will be answered and are welcome. Be sure to check the Asked and answered questions before asking a question. Thanks! This mod is Copyright (2012) and is my intellectual property. Only minecraftforum.net is allowed to host any of my material without my consent. It may not be placed on any web site or otherwise distributed publicly without advance written permission. Descriptions or other content on the mod (for example, reviews) are allowed as long as the download links provided point to this thread. Works derived from this mod in any significant way, for instance by re-using the mods source code, are forbidden without written permission. Thank you. We can possibly get it updated to 1.9pre6 soon. Nice. Love the frown face on the pie. Thanks, I'm thinking of changing it to a creeper face haha. it works and the textures are perfect. Put your pumpkin in a crafting square and it gives you 4 seeds. You can even do this without the mod. Thanks! It was our first mod. We didn't expect all this good feedback! yes we did!! this is a professional post thats why all the replies are positive. This is a really cute little mod, and I agree, the face on the pumpkin pie when it's cooked is a nice touch. Real small and simple but effective! I might just install this one. Edit: Just one last thing, I work in a bakery and happen to know that real pumpkin pies contain eggs, so maybe you could add that to your recipe! Version 1.1 is now available for Minecraft Beta 1.8.1 and 1.9pre5. Added eggs to Pumpkin Pie recipe, increased all foods by 1/2 a food point. does anyone have any suggestions? we are searching for ideas and would like to hear your input. Thanks! We put it in our original post.